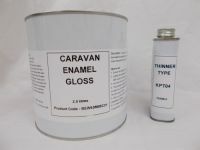 2.5lt Caravan Gloss Enamel Paint RAL Colours Mobile Home - Paints R Us - Number 1 Supplier of your Paint Supplies - We supply paint FAST!! Formulated for use on caravans and mobile homes. Tough, durable and hard wearing GLOSS finish. Good scuff & scratch resistance. 1 x 2.5lts of top quality Caravan Enamel Gloss, plus 1 x 250ml Caravan Enamel Thinner. This product is formulated with reinforced resins to provide a tough, durable and heavy duty GLOSS finish. This product is easy to apply and has excellent resistance to: Weather, abrasion, chipping, and cleaning detergents etc. Ideal for use on all types of caravans, statics, mobile homes and trailers etc. Apply with a good quality brush, roller or any spray system. Size & coverage:2.5 litres, which will cover 30 to 35 square metres. Choose the colour(s) you require from our colour card. Order the number of tins you require via the listing. Then at the bottom of the order form where it says Notes to sellers. Enter the colour(s) you require.